From the left are teacher Diana Weldon, MacKenzie Squair of Cobleskill-Richmondville, Brooklyn Darling of Wynantskill, Mary Rose Duffy of Guilderland, Sylvia Shablovsky of Coxsackie-Athens, Alexandra O’Keefe of Cairo-Durham, and Nusrat Begum of Hudson. 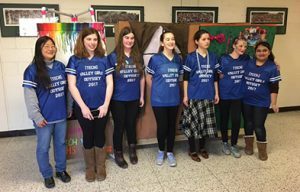 The Tech Valley High School Odyssey of the Mind team placed third in Division 3 for Problem 5 during a regional tournament held at Shenendehowa High School Saturday, March 5. Team members include MacKenzie Squair of Cobleskill-Richmondville, Brooklyn Darling of Wynantskill, Mary Rose Duffy of Guilderland, Sylvia Shablovsky of Coxsackie-Athens, Alexandra O’Keefe of Cairo-Durham, and Nusrat Begum of Hudson. The team is advised by teacher Diana Weldon. Odyssey of the Mind is a creative problem-solving competition. Team members apply their creativity to solve problems that range from building mechanical devices to presenting their own interpretation of literary classics. They then bring their solutions to competition on the local, state, and global level. Thousands of teams from throughout the U.S. and from about 25 other countries participate in the program. Teams members work together at length to solve a problem and then present their solution at a regional tournament. Shenendehowa CSD hosts the Region 7 tournament to teams from all over the Capital Region.